STORRS - It’s not like a prize fight. If one of the UConn football players doesn’t make weight, the show goes on. But head coach Randy Edsall is still pleased that his team is finally beginning to hit the targets its players are given anyway. Every Friday and Sunday each Husky hits the scales. The coaches assign everyone a target, with the players expected to be within five pounds of that mark. Last week, for the first time in 18 months, according to Edsall, every Husky hit the target. “It was the first time we’ve had nobody that is overweight,” Edsall said. Edsall was a little disappointed that it took extra motivation for the Huskies to get to 100 percent compliance. Any player who doesn’t make weight has to pull the sled on the practice field at 6 a.m. the following day. “They have to want to do it for themselves,” Edsall said, a slight annoyance in his tone. The good news, Edsall claims, is that every player making weight is one of the checklist items on his unofficial program development chart. “They’re starting to see all these little things we’re trying to do to get them better,” Edsall said. UConn (1-6) hosts UMass (2-6) Saturday at Pratt & Whitney Stadium. Junior place kicker Michael Tarbutt missed UConn’s game against Memphis with a back injury and was replaced by freshman Clayton Harris. Tarbutt was healthy last week for the South Florida game but he did not reclaim his starting role. Harris attempted all five of UConn’s point-after-touchdowns - he made four and one was blocked. The Huskies did not attempt a field goal. So has Harris passed Tarbutt on the depth chart? Apparently only temporarily. “It’s all based on performance,” Edsall said. “All we do is we chart that stuff during the week and whoever is the more consistent, that’s probably who we’re going to go with,” Edsall said. But the pre-game kicks that each player takes have an impact on the decision-making, too. 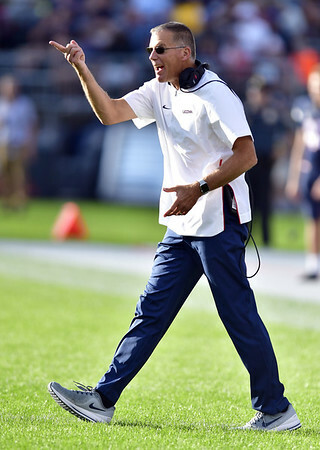 “If a guy doesn’t make any kicks in pre-game, that doesn’t inspire a lot of confidence,” Edsall said. Tarbutt was UConn’s starting kicker in all 12 of its games last season. Noah Iden, another of the Huskies’ kickers, has taken over the kickoff duties though he has yet to attempt a field goal or extra point. A game in which the Huskies had two players rush for at least 100 yards - the second time this season that has occurred - Edsall declared as his offensive line’s best effort. Running back Kevin Mensah and quarterback David Pindell combined for 317 yards on the ground against South Florida. Safety Oneil Robinson has been improving seemingly each week but Edsall still isn’t sure he’s suitable for all game situations. “If he goes outside and it’s above a 10-mile-an-hour wind, he might be blown all the way to Hartford,” Edsall joked of the 180-pound freshman from Capital Prep in Hartford. Robinson has made 22 tackles this season. Posted in Newington Town Crier, UConn on Friday, 26 October 2018 22:23. Updated: Friday, 26 October 2018 22:25.